Action Garage Door offers steel and wood carriage house garage doors that are inspired by architectural elements in the historic Biltmore Estate of Asheville, NC. The classic lines and creative textures of our Biltmore Estate for Your Home® Carriage House Garage Doors are shipped from the manufacturer with their natural wood finish, allowing for you to customize the paint and stain to your liking. Made from a combination of steel for strength and the unique aesthetics of a wood garage door, our carriage house garage doors are an excellent choice for style, design, and durability. Biltmore Estate for Your Home Carriage House Garage Door – Customers love the classic lines and creative textures in this line. Each of these beautiful garage doors combines the strength of steel with the unique, rich beauty a wood garage door offers, and arrives with their natural wood finish, allowing for you to customize the paint and stain. 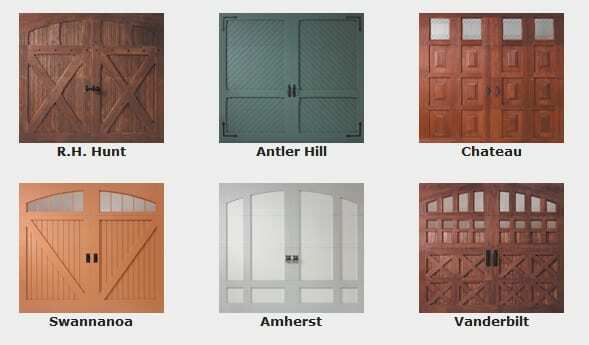 The Bob Timberlake Collection of Carriage House Garage Doors -The Bob Timberlake™ Collection offers the clean, simple, sturdy construction style on which America was built. Each door is made of commercial steel with factory-installed polystyrene insulation that provides an extra thermal barrier against inclement weather. Amarr “By Design” Custom Carriage House Garage Doors – The unique carriage house line of garage doors by Amarr includes 10 different carriage house garage door styles to choose from. The doors are shipped in their natural state to allow for painting or staining. In addition, clear grade wood can be ordered if desired. Carriage house style garage doors offer homeowners a well-crafted door with a variety of decorative options. Whether you desire an old-fashioned, swing-open barn-style look or a more refined carriage house design, carriage house style garage doors are the perfect combination of functionality and technology for your Texas home. From looks that replicate authentic barn-style doors to simpler, yet refined carriage house styling, Action Garage Door has a wide selection of carriage house garage doors to fit your home and the style you are looking for. Action Garage Door carries several lines of carriage style garage doors for installation in your Texas home. While it is difficult to list all garage door pricing online due to the varying costs due to the type of doors you choose, the material the doors are made from, special hardware, etc., Action Garage Door offers low competitive pricing as well as internet specials to help with the cost of carriage house garage doors for your home. In addition, we offer the best warranties in the business as well as FREE estimates on new doors and openers. When you contact us to inquire on the cost of a new carriage house garage doors for your Texas home, you will receive a free written in-home estimate from our experienced garage door representative. Our quote is good for 30 days and we guarantee all of our work in writing. Contact us today to schedule an estimate for carriage house garage doors for your home. We would love the opportunity to prepare a quote for the cost of carriage house garage doors for your home and assist you in choosing the right garage door for your home style and budget. Each Biltmore Estate for Your Home® Carriage House Garage Door reflects the classic look and feel of doors and other architectural elements in the Biltmore mansion. The exterior surface includes a base of Western Red Cedar, MDO, or T1-11 plywood overlaid with Western Red Cedar, which is known for its resistance to warping, cracking, and twisting. For durability and strength, the wood is mounted to a two-inch-thick commercial steel garage door. Factory-installed polystyrene insulation provides an extra thermal barrier. The interior of this classic carriage house line is finished with Luan paneling to complete the rich wood look. The standard size for these garage doors is 14 feet and wider with a double arch unless a single arch is specified when ordering. In addition, the Chateau, Swannanoa, and Vanderbilt models are available with seeded or straw glass. Premium decorative hardware can be added to models in this unique line of carriage house garage doors. The Bob Timberlake Collection evokes the clean, simple, sturdy construction style on which America was built. Each door is made of commercial steel with factory-installed polystyrene insulation that provides an extra thermal barrier against inclement weather. The exterior surfaces of these garage doors are topped with Western Red Cedar, known for its remarkable durability. Doors are shipped with their natural wood finish, allowing for customized paint and stain. Clear grade wood for staining is available by special order. The width of the garage doors in this collection vary from 8-18 feet wide and up to 10 feet tall. The double-arch design is standard unless a single arch is specified when ordering. Windows are made of seeded glass, which adds character to each garage door by introducing a uniquely rich texture. 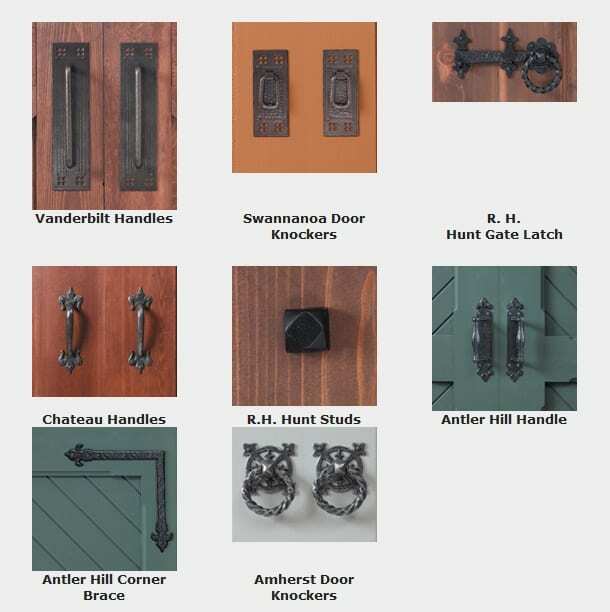 Each door in the Bob Timberlake™ line comes with high quality, heavy-duty hardware. For example, these garage doors feature 10-Ball nylon rollers, horizontal reinforcing, torsion springs, and a heavy-duty track. Action Garage Door also sells the unique carriage house line of garage doors by Amarr. The Amarr line includes 10 different carriage house styles. Each of these doors can be made with either Western Red Cedar, MDO, or T1-11 as the base, with a Western Red Cedar overlay. Doors are shipped in their natural state to allow for painting or staining. Clear grade wood can be ordered at an additional charge. Decorative hardware is also available on both the Bob Timberlake™ and “By Design” garage door models.